Seiad Valley has a reputation as a hiker friendly town, but that wasn't our experience. We think they could use a lesson from Trout Lake. From the cars that whizzed by us on Hwy 96 without slowing or moving over while we walked along the 6" shoulder in the sweltering heat, to the no less than 6 signs around the cafe/store advising what hikers couldn't do, our first impression was negative. The store was a dark, dank, and nearly empty room with a dour woman behind the counter who groused about our packages and refused to sell us quarters. The bright spot was the cafe, where we were warmly welcomed and treated well even though we didn't order much. The tiny RV Park is apparently run by a guy named Bruce, a large guy who wears small tank tops (per our server in the cafe) who takes advantage of hikers by charging $15 to camp, hang out on his lawn, and/or shower or use the coin-op laundry there. After being warned about this by our server, I walked over with my towel to inquire about the cost for just a shower (the sign out front says "PCT Hikers Welcome!" & "Public Showers & Laundry"). The office was empty with a note on the door saying "if my grey Expedition is here, I'm around somewhere." No grey Expedition, and nobody matching the description of Bruce. I wandered a bit and found a coin-op laundry, and an adjacent bathroom with what appeared to be a quarter-operated shower. A big sign on the door said in all caps that showers and laundry were for paying guests only, but I had a few quarters with me.... It turns out that the quarter-taking machine wasn't connected, the water was hot, and there were slivers of soap on the sill. It was the grossest shower stall I've seen on our hike so far, but a shower is a shower. Afterwards I hurried back over to the picnic tables outside the cafe to let Macro know the scene, and he walked over to have a similarly quick but free shower before Bruce showed up. Oh, and the woman at the post office was pretty friendly. But the only area in town to sit down and sort resupply goods (unless you paid to sit on the lawn at the RV park) was a pair of picnic tables and a dirt lot adjacent to a dumpster and outdoor restroom. There was a bit of shade, but in the sweltering heat you can imagine how that area smelled. We had every intention of leaving town by early afternoon but were paralyzed by the 100+ degree heat and caught up in conversation with the other hikers milling about. By the time we loaded up our packs with a full 6-day resupply and maximum water it was already 3pm. We knew we would have to continue along Hwy 96 another mile to cross the Klamath River, but hadn't realized that after that was another 5+ mile road walk before the PCT became a trail again. The highway was blazing hot in the direct sun, and we again received no courtesy from passing cars. We turned up Grider Creek Road for the rest of our drudgery, thankful for little patches of shade and that we weren't staying in Seiad Valley for the night. There were only a handful of cars on this road and for the first few miles it follows along the wide and slow Klamath River. An osprey went by and a bald eagle soared overhead, and we saw tons of Canada geese along the shore. If it hadn't been for the road-walk and the heat, it would have been quite scenic. Our initial goal was to get 8-10 miles out of town before camping, but we discovered on the map that there were camping options at 6.4 and 14 miles, but nothing in between. The earlier spot was a USFS campground at the end of the road-walk, allegedly closed though we figured PCT hikers were probably still sleeping there given the paucity of alternate options. The steep and highly vegetated terrain made it unlikely that we would find a flat spot not already indicated as a campsite on our maps. We decided that given the heat, the weight of our packs, and our late start we should just plan for the campground and be happy that we were out of Seiad Valley and (nearly) on the trail. The road turned away from the Klamath and was only intermittently paved as it climbed gently, passing several rural properties with plentiful "Keep Out" and "No Trespassing" signs posted. With less than 2 miles left to hike, we were passed by a Subaru that slowed, then stopped. The driver rolled down a window to ask if we were southbounding, then offered us a ride to the campground. As tempting as it was, our journey is to _hike_ the PCT, not hitch rides along it. So we thanked her but declined, and walked the final bit along the road. At least our final impression was that of a friendly resident. Neeemor's 6-day resupply to Mt Shasta City fit entirely in this box. Pop tarts for breakfast, Clif & Builders bars for lunch, and ramen for dinner. Oh, and a ziploc of cookie bars with an "I love you" note. No wonder his backpack is so tiny! Grider Creek Campground was filled with signs stating the area was closed due to salvage logging operations in the area from a recent fire. The outhouse was unlocked, though, and we weren't the only ones there. NOBOs King Arthur (from Adelaide), Rainbow (German but living in Barcelona), and an Asian dude whose name we didn't catch all camped there that night along with us and two other SOBOs. We'd met Neemor for the first time at the picnic tables in Seiad earlier today, though we had heard of him from other hikers. The soft-spoken Georgian started 9 days after us and is obviously moving fast, with a UL setup that looks like a daypack. 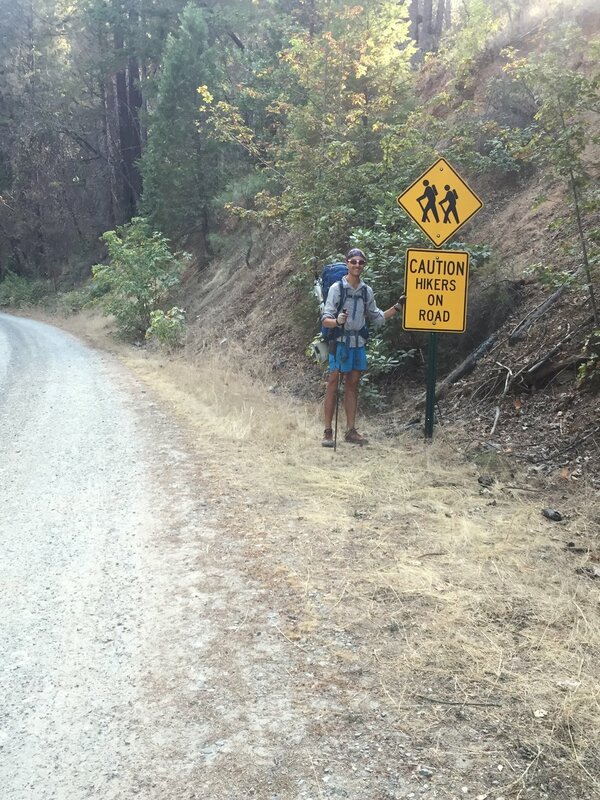 He thru-hiked the AT last year and only just decided to hike the PCT this June, when his family stayed in Old Station on an RV camping trip and he saw the trail passing nearby. When I asked if he was going to do the CDT next he demurred, saying he didn't really want to. And besides, he'd only have 4 months to work and save up for it after the PCT. The problem, he admitted, is that with long-distance hiking you have to either do one trail or all three. Once you complete two you pretty much have to go for the triple crown. He said he was thinking about not finishing the PCT, just to avoid the conundrum. Perhaps he'd quit at Lake Morena (20 miles from the Mexican border), at which we both laughed. But I'm guessing he'll be a triple crowner within a few years. The other SOBO at the campground was Mats (AKA Jorts), who we met as he flew past the morning we were headed to Timberline Lodge. He also started several days after us and we didn't expect to see him again, but it turns out that he took 5 days off in Ashland. We all hung around a picnic table and enjoyed easy conversation while we ate our respective dinners. It struck me how the NOBOs we run into now are the stragglers, who hike relatively short days and are unlikely to finish the trail this year. Our roles have reversed so now it is the SOBOs of the group who are getting up early, hiking late into the evening, and making long miles with a goal in mind while the NOBOs are the relative slackers. I wondered when we we see our very last NOBO, and how far these three would make it. Macro abandons his first attempt at crossing Grider Creek after losing his balance. He nailed it the second try, and kept his feet dry too. On Day 53 we in fact did wake up early and were the first out of the campground, hitting the trail by 6:15am just before sunrise. We had a steady 7000' climb in the first 15 miles, and given yesterday's heat wanted to get much of it behind us while it was still cool. We didn't have high expectations for the scenery but once again were happily surprised. 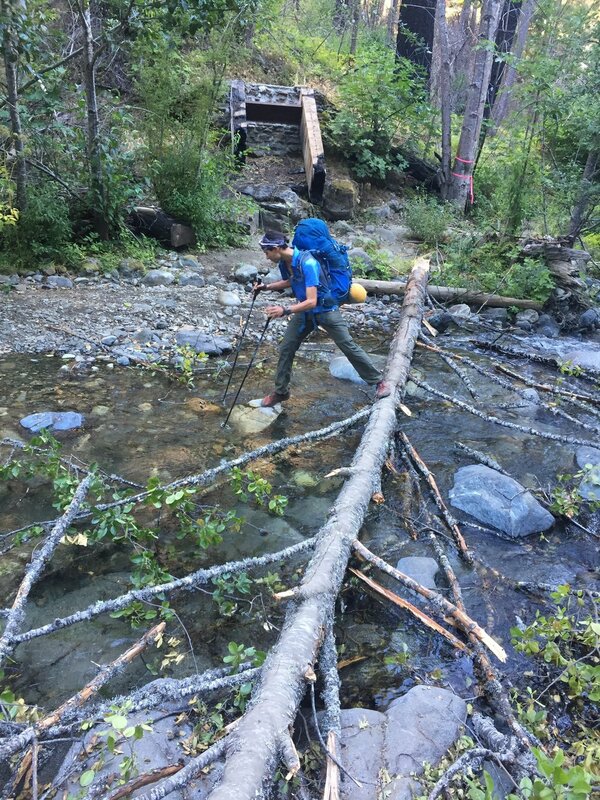 The trail climbs along Grider Creek for the first 8 miles, crossing several times to alternate between the steep canyon walls. Despite the recent burn, there was plenty of regrowth in the understory and some trees were still alive. Madrones, firs, and small maples predominated at the low elevations and we kept a constant eye out for poison oak, which was unfortunatley prolific. Huge pieces of white granite bulged from the hillside and lined the path of the Grider, and gave us a little taste of what we might see in the Marble Mountains. The Grider was a larger creek than we've seen in a while, and in spots its clear waters formed deep green pools that tempted us to hop in for a swim. The faster-moving sections carved smooth curves into the granite, and tumbled the river rocks until they were perfectly rounded. All of this plus the natural air conditioning provided by the rushing water and deep shaded canyon made for an enjoyable morning. The sun didn't hit us until 10am, when we were already halfway through our climb. Neemor and Mats passed us a few miles in, and we suspect we won't see either of them again. After we left Grider Creek, we continued a climb through variable terrain, a mixture of dry exposed slopes and deep shaded forest with a smattering of humid fern and thimbleberry thickets and thankfully small stretches of recent burn. There wasn't much on-trail water, and the only camping options were the ends of abandoned dirt roads. However, a slight breeze and some decent shade made this long climb much more civilized than either of us had dreamed it might be. We popped out of forest at a dirt road near the Cold Spring trailhead and were briefly in a section of the huge burn that we could see on the hill from town. We had long views of ridges in every direction but it was hot, so thankfully we were soon out of the burn as we entered the Marble Mountain Wilderness. We stopped for water and a long snack break at Buckhorn Spring near the top of our climb, a few miles into the wilderness. The water was just a trickle coming through a length of PVC pipe placed into the pool to facilitate collection, but it was sufficient for our purposes and we sat in the shade of a huge tree for a bit of rest and refreshment. The spring was in the middle of a wide buckwheat-filled slope, capped by interesting rock formations and with broad views below to several distant ridgelines. It would have made a great camping spot, but it was too early in the afternoon to stop for the night. There was a NOBO there having a "dirt nap" and listening to a podcast, who told us that he is impressed by the SOBOs he's meeting, as he has never has been able to consistently hike 20-mile days, and subsequently may not finish (for most thru-hikers, that would be a very short day). He was generally a bit odd, but did let us know that the creek in Marble Valley where we were planning to camp that night was running poorly. 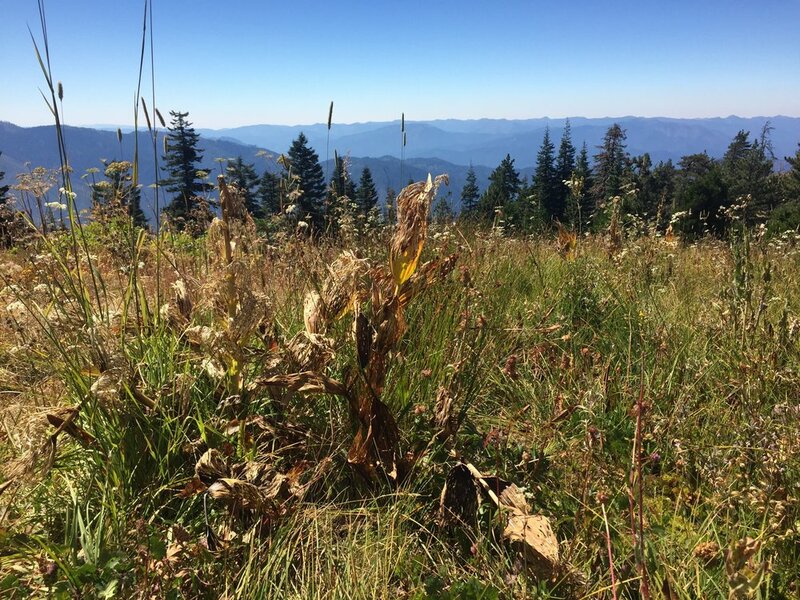 We left him there and continued our hike, generally along high ridges with hazy views of Mt. Shasta. 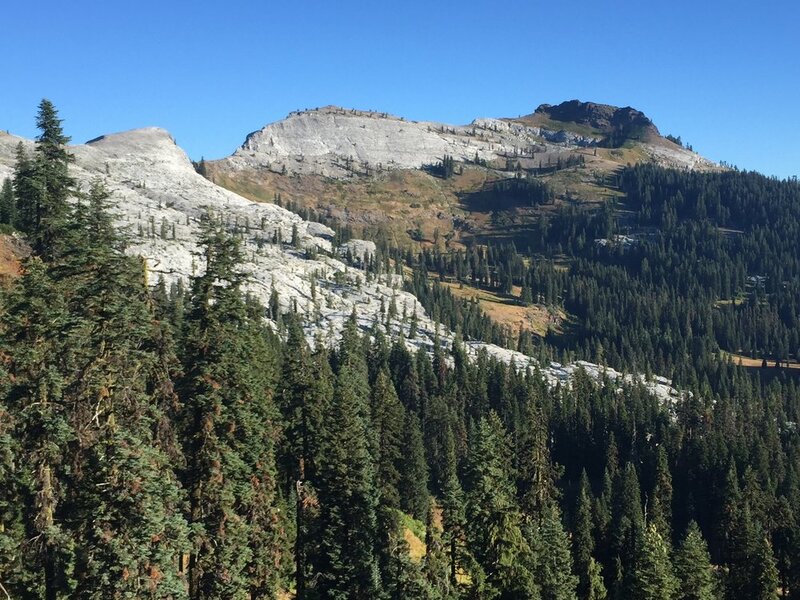 These rugged mountains with rocky outcroppings and steep green or forested slopes made good eye-candy, though we were saddened by the wide swaths of dead trees on many hillsides (presumably from bark-beetle damage). We climbed to a dramatic rocky knoll with a handful of windswept trees contrasting against the red earth and the blue sky, and could have spent an hour there just looking at each tree from every angle. The heat kept us moving, and fortunately it wasn't long before we dropped onto the shady forested slope of the next ridge. The trail meandered around adjacent slopes for a bit. Up close, the green areas of these rugged mountains are covered in wildflowers, and at the higher elevations there were still some in bloom though others were showing signs of transition to fall. 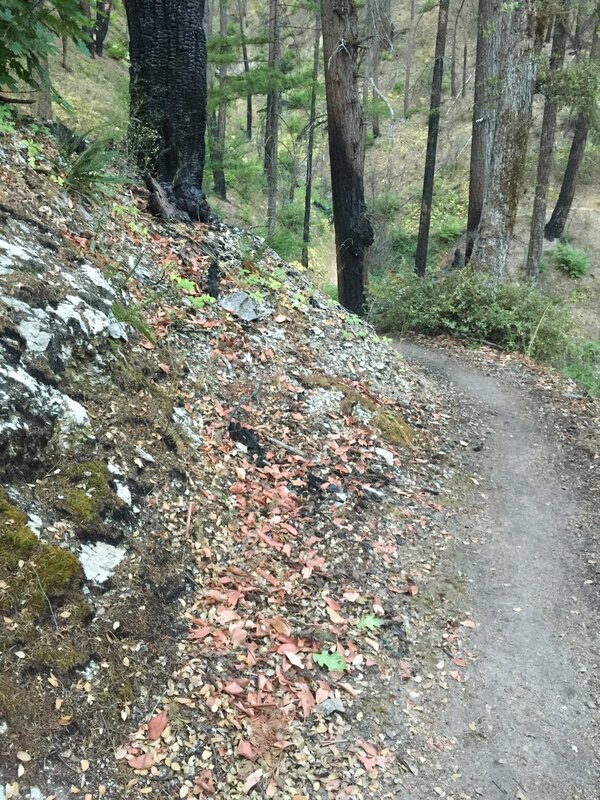 The trail generally makes a high traverse between slopes, somewhat reminiscent of northern WA. We passed small and shallow Paradise Lake, not that appealing but nevertheless surrounded by weekend campers and a few groups of hunters on this Saturday in late August. In the late afternoon we got our first glimpses of Black Marble Mountain. Its upper knobs are black but the rest of the slopes are glistening white marble wherever there isn't green vegetation. As we neared this stunning peak, we started seeing white marble along the trail, in talus fields, and in broad shelves of rock containing intricate crevices that just invited exploration. The pale rock gleamed in the low-angle sunlight and it was difficult to make progress as we stopped to exclaim and explore at every corner. We passed a few sweet campsites set in a grove of hemlocks growing right from the marble shelves, but they appeared to be taken by hunters and besides, we needed water. We dropped down to the next creek, where we stopped to make dinner and fill up our reservoirs. Having lollygagged through the marble after a long day's climb, we ended up hiking the final 1.3 miles to our campsite in Marble Valley by headlamp. We saw 18 NOBOs on the trail today, but had the entire valley to ourselves for camping. The saddle above Man Eater Lake has a convenient granite "bench"
Day 54 started out hot. We climbed through a bit more white rock in Little Marble Valley, then worked our way up to some high ridges that were variably forested, sage-covered, open, or burned. We had more hazy views of Mt. Shasta and noticed what seemed to be new smoke behind some ridges to the north. 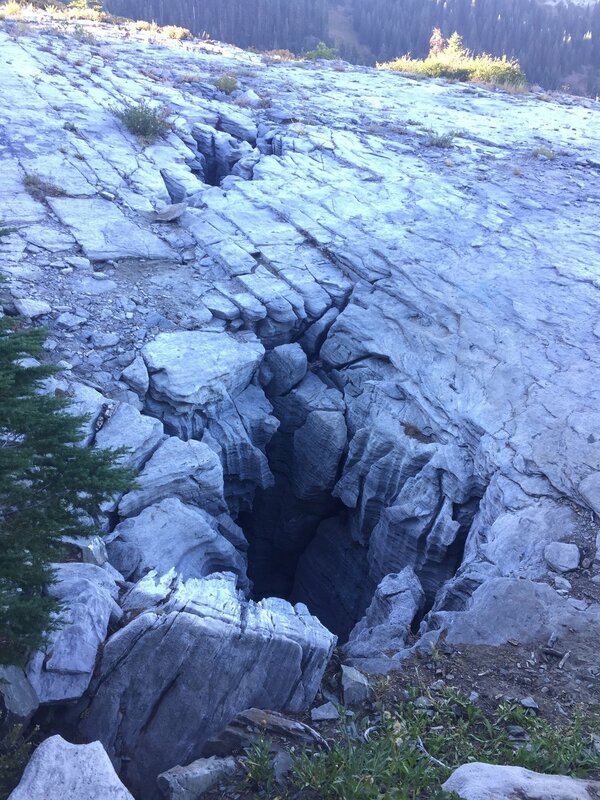 Water was scarce on-trail today, and we hoped to make 30 miles which would put us at a lake 7 miles south of Etna Summit. The rocky terrain and frequent ups & downs slowed our progress, as did the spectacular views. In the late morning we made a long traverse towards a deep and clear blue-green lake sitting in a high shelf at the base of a craggy peak. We both agreed this was a place we'd love to return to and explore further, and spotted what looked to be a perfect campsite near its shore. 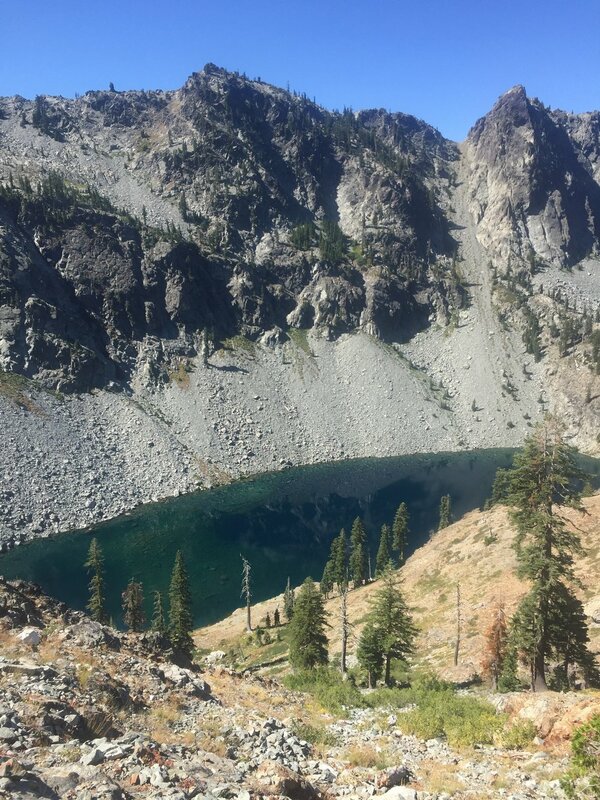 We ultimately passed well above what turned out to be named Man Eater Lake, and crossed the nearby saddle to descend into a high alpine basin rivaling any we have seen in the Sierra. 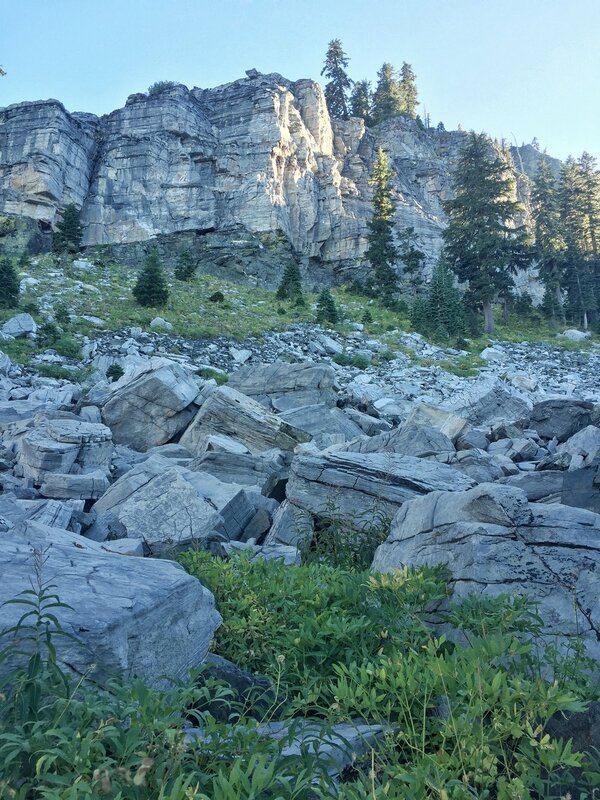 There were piles of granite talus, stands of western hemlock and white pine, wildflowers galore, steep rocky crags, a tumbling creek, and deep blue sky above. We decided to take our mid-day break early and lounged right on the granite rocks of the trail where it crossed the creek. We had seen only one section hiker and no thru-hikers today, and nobody came by in the 30+ minutes we hung out in the sun with our toes in the cold water. It was the perfect spot, and the perfect day. As we started back down the trail, we even found a large stand of huckleberry shrubs with big juicy ripe fruit. I love the Marble Mountains! It's hard to believe we've never been to this wilderness, since we have backpacked in the nearby Trinity Alps many times. After this first taste, I'm certain we will return. The afternoon consisted of more high traversing. We passed a few small lakes that were really more like large ponds, then were in & out of forest on scenic but hot, exposed and rocky slopes for the rest of the day. 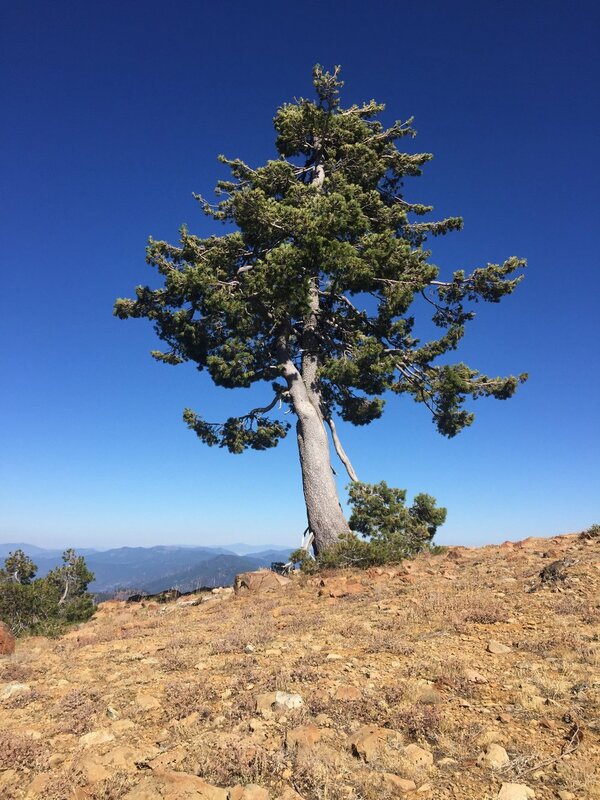 Several knolls had bonsai-like ancient trees growing straight from the rock, while others were sage-covered with patches of blooming buckwheat and silvery lupine gone to seed. We realized that with the terrain, heat, and our penchance for enjoying our surroundings, 30 miles would mean at least a few hours of hiking by headlamp and didn't seem reasonable. Our remaining options were limited. The last two water sources before the road at Etna Summit were reported to be marginal at best, and even if we ate dinner at one then camped at the last known spot before the road we'd have hiked less than 20 miles. On the other hand, the first water source beyond the road was 6 miles in up a stiff climb, and the first campsite was a mile further. Suddenly, a night in town started to look pretty good. If we could catch a ride the 10 miles into Etna, we'd get a 25 mile day in, have water and a place to sleep for the night, and could get a fresh start on the other side of the road tomorrow morning. We passed our first two NOBOs of the day, who reported they'd been in Etna and it was a nice town, but a difficult hitch due to low traffic on the road. A few miles later we passed a third, who said he'd spent 3 days at the Motel Etna and highly recommended it. He confirmed there was little traffic on the road, but he had gotten a ride within half an hour. This was encouraging. Of course, he had left the road at 9:30am today and it had taken him 6+ hours to hike the 8.5 miles we had left, which was not encouraging. We checked the elevation profile and confirmed there was only ~1200' elevation gain and a similar drop, so it should not only take us about half as long to get there. These are definitely the stragglers of the bunch. As we continued on the trail, Macro pointed out that it was Sunday evening and we'd be hitting the road sometime after 6pm, so perhaps we should have a contingency in case we couldn't hitch a ride. The town is only 10 miles away, but the lake we were planning to camp at is only 7, so we are certainly not walking to town tonight. We passed one more NOBO in the late afternoon, making a grand total of just 4 for the day. Our problem was solved when we crested the final saddle before making the final 3-mile descent to the road. We had a great (though hazy) view of Mt. Shasta, an increasingly large plume of smoke to the north, and cell service. I called the Motel Etna to see if they had space for the night, and asked what they thought the odds were of hitching a ride this time on a Sunday evening. After a bit of conferring on the other end, innkeeper Ryan asked what time we'd be at the road and said his girlfriend Sharon would come pick us up! We hustled down the trail to make our 6:30pm date, and within a few minutes of our arrival Sharon drove up. 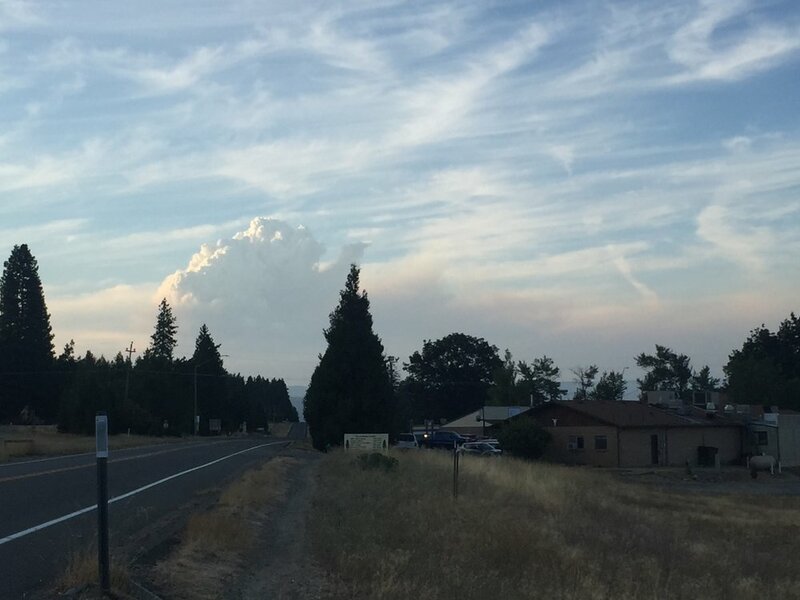 On the way back to town we learned that the billowing smoke is from a huge new fire near Happy Camp and just 5 miles north of Seiad, which is not yet at all contained and has caused many to be evacuated. We had good timing, and hope it can be controlled soon. As for Etna, it is a small town, though has a few restaurants and a small supermarket. We found the Motel Etna to be small but clean and extremely welcoming. In addition to picking us up from the trail there was a hiker box near the office, they had plastic trays for soaking feet in Epsom salts, and they even offered to do our laundry! We walked to Dotty's cafe, where we enjoyed delicious veggie burgers and a huge basket of sweet potato fries for dinner. The supermarket was our next stop to get ice cream (but of course), stuff for breakfast, and a few fresh items to supplement our trail food between here and Castella. We couldn't be more pleased with our unexpected town night, and glad it is in Etna rather than Seiad Valley. Tomorrow we're going to check out the bakery then head back to the trail, where we will be headed towards the Trinity Alps.